Koramangala has a plethora of places to eat particularly if you have money. But for those who are, umm, lacking in funds, not to worry, we’ve got you covered. It’s okay to step out with a light wallet and explore the streets of Koramangala to eat a satisfying meal all under INR 500. See, we are nice like that! Start big with the Funky Monkey Waffles. We are not going to tell you what’s in it, except that you’ll be stuffed by the time you finish the last bite. Popular bites include Grilled Chicken Sandwich, and The Complete Meaty Omelette. Do ask for the Fresh Juice of the Day if you are feeling thirsty. This place will have you spoilt for choice with their big selection of crepes. 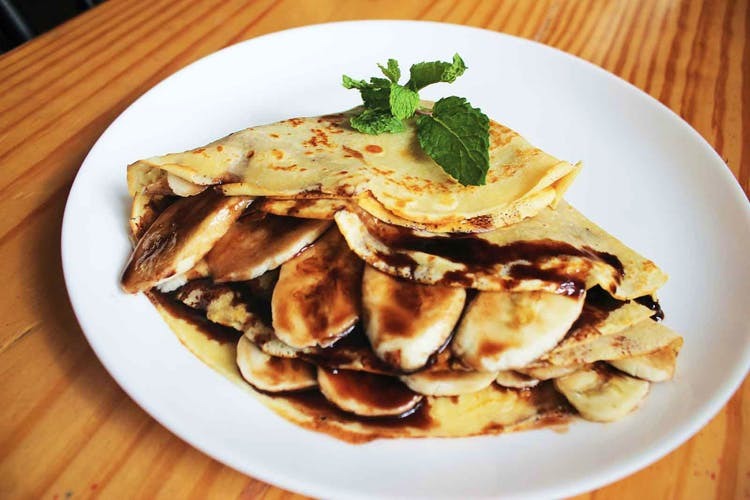 We recommend you try Plain Crepes with Nutella, Kiwi Crepes with Peanut Butter & Chocolate, and Apple Cinnamon with Honey. The must-try savoury crepes include Spicy Pesto with Veggies, Mushroom Crepes with Cheese, Smoked Chicken Sausage Crepes with Mushrooms & Onion, and the Chicken Breast Crepe. Known for their comic book-themed decor, Terra serves up some good waffles and sandwiches between just INR 120 and INR 250. If you are dropping in for lunch, go for the Sri Lankan Curry (chicken) & Rice. The Chicken Catalan is a favourite too. Nestled in the lane right next to the petrol bunk in seventh block, Maxpresso offers breakfast, full meals (Continental) and snacks, as well as a range of coffees whose beans they curate periodically. You can easily have their full breakfast platter (or a standalone item) and a coffee under INR 500. In fact you can have nearly any food item on the menu with a drink and walk out with a full tummy, and a relatively full wallet as well! Salads form the main course at this European-like bistro with an option of having it as a warm bowl, wrap, and a whole wheat grilled sandwich. Opt for a warm bowl with stir-fried noodles. And if you and your friend are watching what you eat, then go for quinoa or brown rice. You can create your own salad bowl. The options are endless with sauces and top-ups for you to mix and match. Koramangala's only travel cafe takes travel bit all too serious with their menu also very global. Everything's under the INR 300 mark, with the eggetarian cafe menu covering a bit of Chinese, Italian, Indian, and Mexican. Visa Vada Pav and Captain Crispy Chilli Potatoes are perfect munchies, but give the pasta a mix as it's been hit and miss with us. Aint no party like a samosa party we say! And there's a cafe that is fully desi at heart for when you want samosa and chai to satiate those 4pm munchies. They do make a mean North Indian breakfast as well (think Chole, Vada Pav and Bun Maska). They're also one of the few places that have a couple of non-veg samosa options, so go with the squad, you'll likely still spend INR 500!